Any Interest In A Rear Hub Slider? 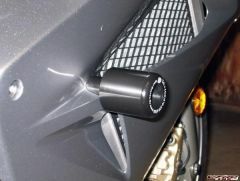 Also interested... Let us know when you nail down the prices and if you'll be offering a combo front/rear price. 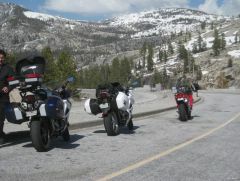 That pic was taken on June 19th 2010, but given this winter's snowfall who knows when Tioga Pass will open this year. It typically opens the first week of June...my guess is two weeks later than normal. PS: I'm kicking around an idea of doing another 4-day Sierra Nevada Ride sometime in either late August or early September. What's a good way to make this check? Technically you would want to test a run of wire end-to-end, but that isn't possible with the stator wires because you cant easily get to the ends. But what you can do is test the stator per the service manual. So you'll have to somehow get one of your multimeter leads underneath the insulation of each connector or splice on the side that is nearest to the Rectifier/Regulator, and then connect the other lead to ground. The manual says the resistance of each yellow wire to ground should be between 0.1 - 1.0 ohm (which indicates a good stator), so if you have more than 1 ohm then you probably have an issue with your repair/modification. Those splices look soldered to me, and the fact that they burnt at the splice means that you had a bad solder joint. And based on this picture I say that the failure most likely resulted from resistance and not over-voltage, so keep that in mind when you solder wire-to-wire or use solder to fill in crimp connectors. It's always a good idea to make sure the splice did not create any resistance in the wire, especially if the wire handles a lot of current or voltage. They were soldered, I guess I'll have to work on a better connection next time. This was the other end of the splice, showing a lot of heat at the crimp. Were those quick disconnects crimped and soldered, or just crimped? Either way, you can see evidence of heat there too. But that's exactly how I bypassed the OEM stator connector on my bike, and now I'm wondering if my quick disconnects are also burnt. I don't know what to say about these connectors, except that maybe you used quick disconnects smaller than 14 gauge? If so, as a general rule of thumb then I don't anything less than 14 gauge would be capable of handling the current flow that each phase of the stator is capable of producing. FYI...on a 12 volt system, for a short length of wire 14 gauge is rated at 30 amps, but 18 gauge is only rated at half that. Those splices look soldered to me, and the fact that they burnt at the splice means that you had a bad solder joint. And based on this picture I say that the failure most likely resulted from resistance and not over-voltage, so keep that in mind when you solder wire-to-wire or use solder to fill in crimp connectors. It's always a good idea to make sure the splice did not create any resistance in the wire, especially if the wire handles a lot of current or voltage. 6th Gen - Blue Connector Ground Fix - How To. When it comes to the electrical system affecting how the bike runs, I think the VFRness pretty much takes care of the voltage and current capacity/load problems on the 6th Gen bikes. 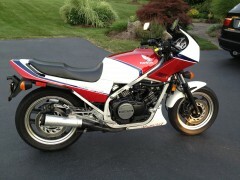 The only other thing is to try a PCIII, as it really helps with the VTEC transition on my bike. Too bad we're on opposite sides of the planet or else I'd let you try my PCIII to see if it makes a difference. If you as me, the VTEC engagement spot is a tough area to try and hold a steady rpm, and I would think a little surging would almost be normal as the engine transitions from 2 to 4 valve operation. I don't know if you're running a Power Commander, but I have a PCI USB and with Cozye's map, the VTEC engagement is a lot less abrupt and manageable. I still get a little surging though, so I try to either be above or below the VTEC sweet spot. Having said that, aside from the VTEC surge, I think most of my surging problems have been caused by other electrical issues. If you read my posts, you'll see that I noticed a big improvement when I replaced the battery, and just recently I noticed that my low speed mid rpm problems seemed to be coming back again. I thought a new battery was in my future... Just last week though, my Starter Relay fried and the connector mating to it was melted, but after I replaced both I noticed another improvement in how the bike ran. Anyway, if the VTEC area is the only place where you have surging problem I suggest a Power Commander and Coyze's map. If you have surging in other areas, I'd start looking at electrical improvements such as Tightwad's VFRness. I'm not 100% sure if the blue connector ground wire mod completely eliminates the need for the front wiring harness replacement, but with the new recall front harness, the ground wiring for the headlights is now routed to the right side of the bike and is tapped into the RR wiring instead of going through the blue connector.